The US stock market is on fire. The American economy is clipping along at the best pace in a long while. Financial conditions are still easy. Not surprisingly, high-yield bond spreads are within spitting distance of recent tights (lows). This is all to be expected in an environment of economic expansion. As a macro guy, there is nothing unexplained with this picture. But I must admit, I don’t follow the day-to-day movements of different parts of the bond market as much as I should. 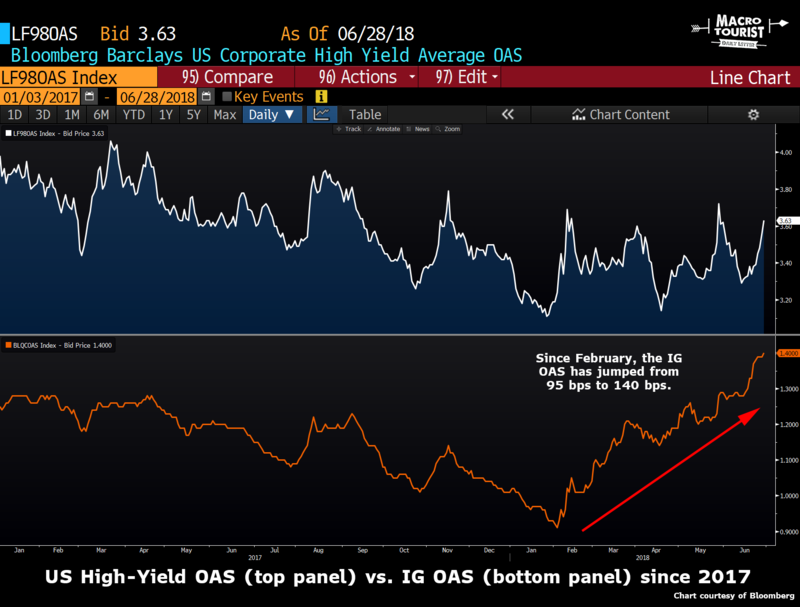 Luckily, I have friends at credit shops who recently brought to my attention the divergence between investment-grade OAS (Option Adjusted Spread) and high-yield OAS. For those not familiar with OAS, think about it as the spread you earn on top of the risk-free government rate for taking the credit risk of a corporate bond. For example, if government bonds yield 2.25% and the comparable high-yield index yields 5.50%, then the OAS is 3.25%. 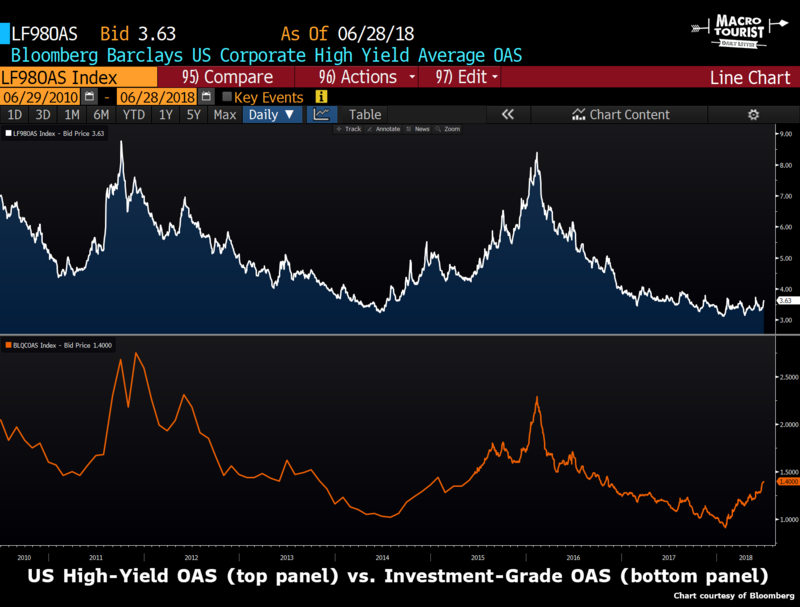 Obviously investment-grade bonds (those with a credit rate BBB- or higher) will typically trade at a lower OAS than high-yield bonds (those rated below BBB-). But generally you would expect the two indexes to follow each other relatively closely. And in fact, stresses often show up first in the high-yield market. Yet, something unusual is happening in investment-grade bonds. Even though most other risk indexes are well bid, investment-grade bonds are struggling. Here are the two different indexes since 2010. Let’s drill in on the action over the past year and a half. 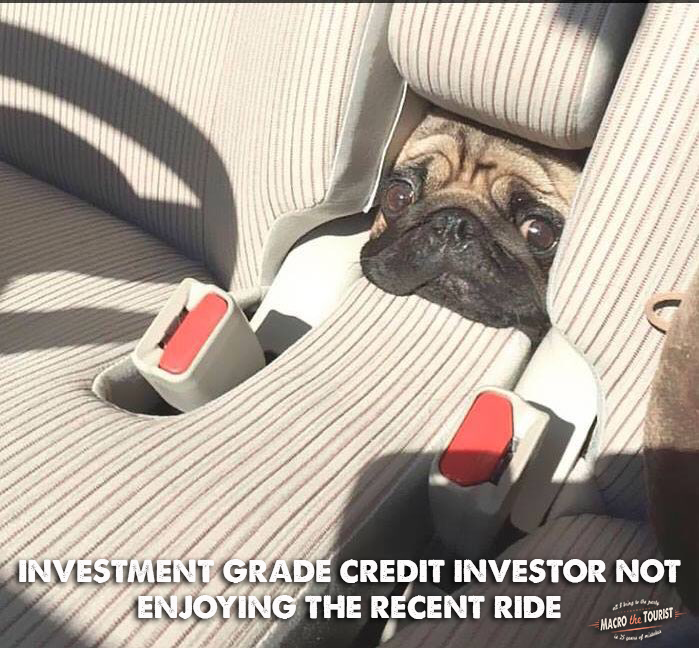 The past five months have been brutal to investment-grade credit investors. 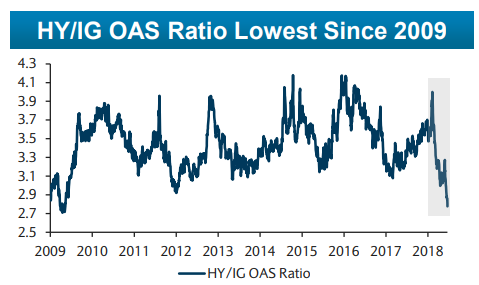 IG OAS has risen from 95 bps in late January, to 140 bps today. This is a big move for investment-grade bonds. it is an especially big move considering the fact that most other risk assets are not following suit. 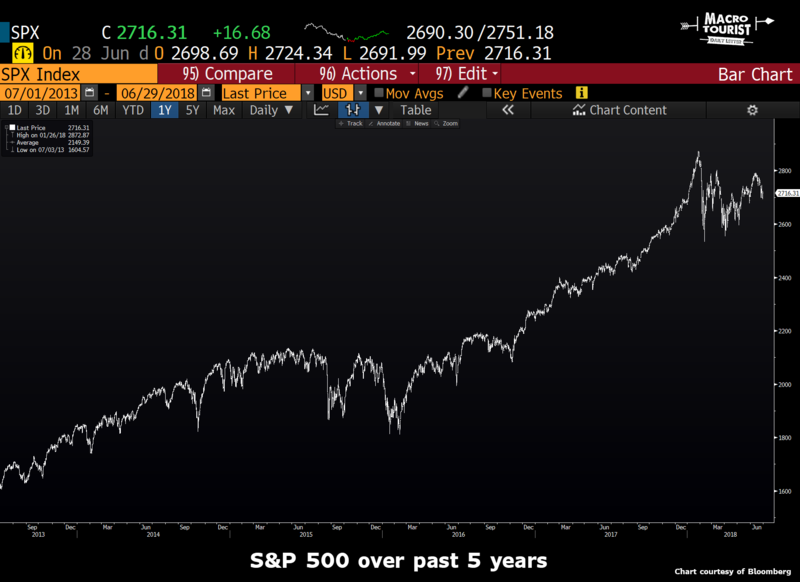 Is the investment-grade sell-off overdone? 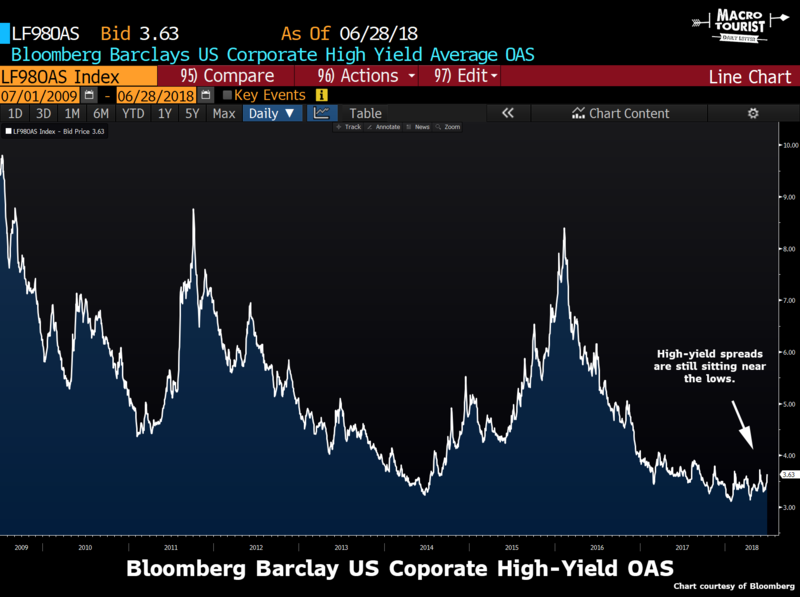 Or is high-yield due for some catch-up on the downside? I don’t have any answers, but it is interesting that investment-grade bonds are having such a difficult half-year. Maybe we look back at this period and say it was a great buying opportunity. But maybe we look back and say, the investment-grade bond market knew something way sooner than the rest of us. PS: If you haven’t had a chance, don’t forget to check out East West’s latest research piece - U.S. Banks Poised to Outperform Canadian Counterparts.